We have the things you will need to keep your Eurostyle 80 in tip top shape for years to come. The correct filter media, lighting and heating are all available from stock with first class service and delivery. Choose from a full range of heating, lighting, filtration, and filter media products for EuroStyle Bow Front 80 aquarium setups. We have every available spare for all Aqua One aquarium along with a complete range of cleaning and decorative ornaments for that perfect finishing touch. Keep your EuroStyle Corner 85 aquarium in tip top condition with genuine Aqua one consumables. Using only genuine Aqua One products will keep your aquarium looking great and help to promote the health and well being your aquarium inhabitants. Not sure about what lighting to choose? Just give us a call... we're always delighted to help! Trust Aquarium Parts to help make your Eurostyle 100 a great, long term success thanks to our excellent stock of all the spares and accessories you'll ever need. Don't forget that, if you need to stock up, larger orders come complete with free first class delivery. Good maintenance is the key to keeping your EuroStyle 120 looking fantastic. So do clean your filter every month and change the T5 tubes every six months to keep everything sparkling and algae levels low. Every component you could ever require is available to short order. Do call us if you are not sure what to order. The spacious EuroStyle 150 is worth maintaining well so start as you mean to go on with a monthly filter clean and water change. Adding some activated carbon to your filter provides a great boost in efficiency and the best health boosting water conditioners should always be used. If anything wears out or gets broken you can also rely on Aquarium parts for swift replacements at low cost with fast dispatch. Aqua One's excellent EuroStyle Series aquariums bring large screen viewing pleasure in a variety of sizes and finishes, including beech, black and oak. The EuroStyle Rectangular tanks have been revamped recently with matching modern, chunky cabinets available in both black and oak, to match current furniture trends. Available in tank sizes ranging from 80cm to 150cm, the inspiring EuroStyle Series graces any home or office ennvironment. The generous height of the EuroStyle aquaria provides large screen viewing with excellent, high output T5 lighting and canister filtration. A new range of well built, modern cabinets are available for this series, including oak and black. 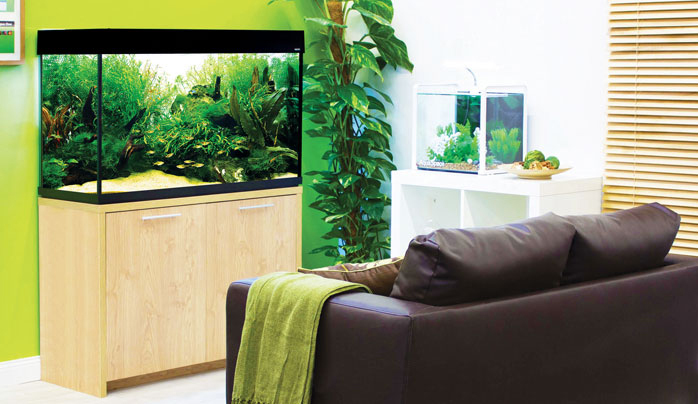 As ever, Aquarium Parts provides a full range of products each EuroStyle aquarium, from heaters and filtration elements to complete replacement lighting units. If you can't find the exact part you need for your EuroStyle don't worry... just give us a call. We can get every available spare for this series, with most items available from stock.